Would you like to organise an event to support Florence Nightingale Hospice but have no idea where to start? A Strawberry Squeeze is a simple and sociable event idea which Florence Nightingale Hospice Charity has designed to provide a theme and fundraising ideas for those looking for inspiration. 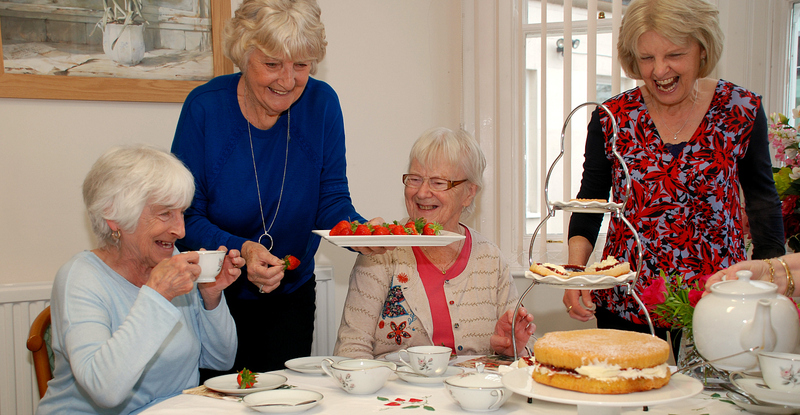 Anyone can hold a strawberry-themed social event for friends and family – from a strawberry daiquiri cocktail evening to a strawberry-themed afternoon tea – which can raise money for vital hospice care in Buckinghamshire. Our supporters have been rising to the occasion by holding all sorts of Strawberry Squeeze events to raise money for the Hospice! Sue and Barry Cato who held a Strawberry Squeeze Bingo with afternoon cream tea and raffle and raised £577.50. The Hospice Lottery Partnership who raised £50 from a strawberry bake sale in their office. The residents of Florence Court in Aylesbury who raised £170 from a Strawberry Squeeze afternoon tea party. Val Truby who has raised just over £160 at her flower arranging demonstrations with strawberry-themed displays! Why not try one of the following event ideas? Cream Tea, complete with strawberry jam, of course! Daiquiri and Chocolate Party - strawberry daiquiris and a chocolate fountain with strawberries to dip in: yummy! Strawberry-themed Moveable Feast - each host does a different course in their own home, with the whole party moving on to another house for each course! How can a Strawberry Squeeze raise money for the Hospice? Have a Raffle or Tombola - ask each guest to bring one item to the party (maybe even something bought from a Florence Nightingale Hospice Shop!) and use the items for the raffle or tombola. Get your guests to enter the Strawberry Sweepstake - everything you need is in the Strawberry Squeeze pack which you can request below or email strawberrysqueeze@fnhospice.org.uk and we'll send you one. Charge guests £1 to enter a Strawberry Quiz or other games or competitions such as a strawberry and spoon race or Hunt the Strawberry! Even if your Squeeze only raises £50, this will cover the cost of the daily Afternoon Tea in the In-Patient Unit, which means so much to patients and their visitors. "Having a cup of tea and cake served at 3.00pm was a blessing." How will FNHC support you? FNHC will provide you with a Strawberry Squeeze pack which has lots of fun ideas for fundraising and recipes for catering as well as a checklist for organisers from start to finish. Click here to request a Strawberry Squeeze Pack.